The Venture Brothers season 3 started on Sunday. The first episode was great and it is proving to be one of the funniest shows on TV. Of course if this was the first episode you watched you would be very confused. The Venture Brothers didn’t even appear, Dr. Venture only appeared in a flashback, and Brock was only seen from a distance. They chose to open the season with and episode all about Dr. Venture’s former arch nemesis, The Monarch. 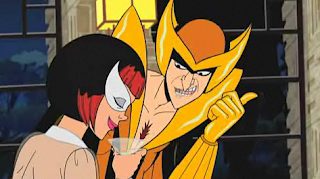 He was on trial for various crimes by the Guild of Calamitous Intent. And hilarity ensued. Of course he got off and he and Dr. Girlfriend went off on their honeymoon, to kill the traitor Phantom Limb. During the trial the Council of 13 had this hilarious side discussion on when to yell “Silence!” One guy yelled “Silence!” while one of the other council members was talking. That’s not how you are supposed to do it, only when the witness is speaking. I want to just start yelling “Silence!” at everyone for no reason, especially the two women talking outside my cubical right now. The Murderous Moppets made a comeback. I liked the canned villainesses that were displayed. Also, the existence of a villain called Joseph and the Amazing Technicolor Nightmare was funny.